Why Should You Hire Weill & Associates? Hiring Weill & Associates is a hassle-free and pleasant experience. The quality of our work is proven and rigorously controlled from start to finish, and we always deliver on time. When you trust Weill & Associates with your documents, you can rest assured that you are investing in a successful outcome. As an ATA-certified translator, I am able to offer my clients peace of mind. 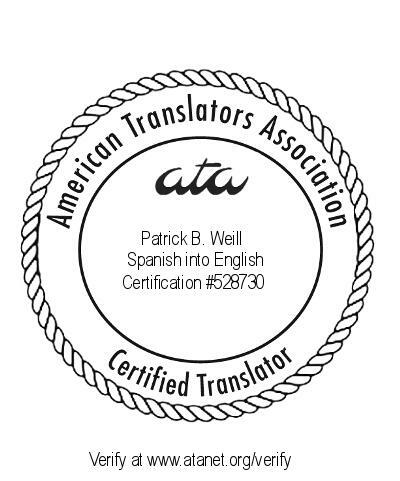 People who hire Weill & Associates know that the largest and most important translators association in the United States has tested and approved my work. My mastery of Spanish has been certified by the National Autonomous University of Mexico (UNAM) at the highest possible level, so the entire process, from the correct interpretation of the source text to the rendering and finishing of the final target text, is flawless. All linguists whom I hire are evaluated as to their proficiency, efficiency, and experience. Every person involved in every project is a qualified translator who is paid well to produce excellent work. I am part of a large network of seasoned translation professionals and thus am able to offer my customers a service that is accurate and fast. Why should I hire Weill & Associates when I could pay less elsewhere or even pay nothing for machine translation? You should hire Weill & Associates because you don’t want to risk your professional success on an inferior service just to save money in the short term. It often proves very expensive to save money in the short term; long-term professional results depend on eliminating unnecessary risk and optimizing future outcomes, and when you hire Weill & Associates, there will be no future surprises or negative consequences resulting from erroneous translated or edited material, and all future possibilities are optimized as a result of our high-end service. I invite you to contact me for a free estimate and/or assessment of the translation or editing work you need done, by writing me a message using the contact form provided on the home page; you can also send me files in this manner. Documents entrusted to Weill & Associates always produce the desired results: our impeccable-quality translation and editing will maximize the future possibilities of your material. © 2019 Weill and Associates. All Rights Reserved.